Sawan Masih has been on death row since 2014, and his appeal is fixed to be heard on November 27 by the divisional bench before the Lahore High Court. 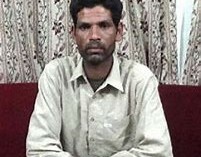 Sawan Masih was accused by his Muslim friend Shahid Imran of making derogatory remarks against the Holy Prophet in 2013, and a case was registered against him under section 295-C of the Blasphemy Law which has a mandatory death penalty. After the accusation a large Muslim mob attacked Sawan Masih’s residential area, Joseph Colony in Badami Bagh Lahore. The local mosque broadcast the accusation via loudspeakers and a mob of more than 3,000 angry Muslims attacked Sawan’s home and looted and torched 180 Christian homes, 75 shops and at least two churches, while the police stood idle instead of stopping the attackers and protecting local Christians. Hundreds of families were displaced as the mob threatened to burn Christians alive in their homes unless they left. Sawan was handed over to the police and has remained in custody ever since. On March 27th, 2014 the Lower Court sentenced him to death for committing blasphemy against the prophet. Soon after this verdict CLAAS filed an appeal against the conviction in the Lahore High Court, which is going to be heard on 27th November. Sawan Masih’s wife and three children are very concerned and living in fear. CLAAS is providing free legal aid to Sawan Masih and supporting his family, but your prayers and support are very crucial for his safety and release. Nasir Saeed, director of CLAAS-UK, said this is a very unfortunate situation as although Asia Bibi was acquitted on 31 October by the Pakistan supreme court, she is not allowed to leave Pakistan despite several western countries being willing to accept her and her family. This is because the leader of the Islamist party Tehreek-e-Labaik Pakistan has threatened the government, saying if she leaves the country, there will be war. Unfortunately for the last several decades, Islamist groups in Pakistan have become more powerful than the state. Now the situation is that everyone, whether it is the prime minister or the chief justice of Pakistan, they have to proclaim publicly that they equally love the prophet and would sacrifice their life for the prophet. A review petition and separately a petition to add her name in the exit control list (ECL) has been filed in the supreme court and keeping in view the present situation I don’t think the review petition will be heard very soon. Mr Saeed also said that Pakistan’s President Dr Arif Alvi’s statement that the government will not amend the blasphemy law is not very encouraging as we all know the blasphemy law is often used by Muslims to settle personal grudges and scores against their rivals, and Christians are the main target. He said the blasphemy law needs change to stop its continuous misuse and the international community needs to remind Pakistan of this regularly.